The first three films of the Star Wars saga serve as paradigm for the movie trilogy. Both sequels had three years to develop. What the first film started the third one finished. All of the films were box office phenomena. The cinemagoer wanted more. In comparison the Final Destination sequels in the first trilogy also had a three year gestation period. In contrast the Final Destination sequels are merely remakes of the original. However the brand had been established and owned its market. In today’s money Final Destination 2000 made a domestic $69.4million. Final Destination 2 2003 grossed $56.8m. Final Destination 3 2006 earned $60.2m. With the trilogy over but with a robust box office New Line decided to commission part four. 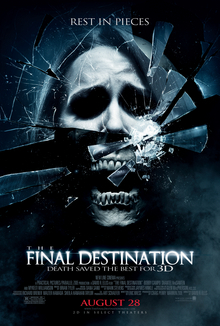 The Final Destination 2009 arrived on schedule – three years after its predecessor. There was no series hiatus as such – even though the studio publicity inferred that there was. The new title alone demonstrated as much. It wasn’t so much a rebranding as a reintroduction. No reintroduction necessary. The format, plot and layout of this fourth instalment is as carbon copied from the original as the other sequels. New Line has a cash cow and they are not going to genetically modify it. They did tinker with Shirley Walker’s original score but that wasn’t going to induce Fanboy boycotts. To wit more so than Freddy and Jason in the 80s the Final Destination sequels are product as entertainment with no camouflage of art. The movie business is run by corporations. In this case New Line Cinema1 is owned by Time Warner. Corporations2 exists to generate profit in the same way a man cannot exist without sustenance. The difference is that when a man is sated he will stop consuming. The corporation will never stop. The product a corporation chooses to trade in (be it movies, pharmaceuticals, firearms) makes no difference. The corporation will continue to churn out product until the market is dead. This is the Hollywood ending. The corporation is anathema to the arts: new stories are not allowed to be told; experiments are not allowed to be tested; the culture is constrained and contained. Corporate film is anti-cinema. Hollywood is simultaneously the antithesis and epitome of the horror film. The Final Destination has no new story so it uses new technology. This series was tailor made for 3D but here at Thrill Fiction the belief is that 3D is not fit for cinema. It will be a good for gamers but it is extemporaneous in the storytelling arts. It’s a gimmick – a distraction – like smell-o-vision3. The definition of art (for dummies) is to create something out of nothing eg a film script. It is not uncommon for the artist to create under life threatening conditions. It is common for the artist to create under restrictive conditions. The Soviet Union no longer exists but it is the corporation and not the communist party that now dictates censorship. On the surface The Final Destination is Hollywood fast food. That’s all it was meant to be. New Line hired both the writer and the director of Final Destination 2 to make this instalment like the one they made before. Yet something happened on the way to the cinema. 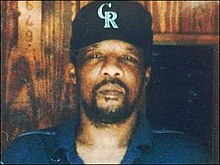 In 1998 James Byrd Jr4 was murdered by three white racists. They beat him then chained him to their pickup truck and drove off – dragging him (subsequently his corpse) on a rural road in East Texas. Writer Eric Bress incorporated this horror into the film. In The Final Destination it is the white racist who dies by his own truck. Martin Scorcese should be so bold. Eric Bress succeeds in being subversive in a mainstream movie. This is the raison d’être of the writer. James Byrd’s terrorist murder lives on through The Final Destination. It serves as a reminder of the horror that exists outside of cinema. It puts a bloody thumbprint on this film series. The Final Destination grossed a domestic $69.3m (adjusted for inflation). The market for this franchise is not yet dead. It is thriving. It has outlasted its inspiration (Scream 1996), pretenders (Urban Legends 1998) and usurpers (Saw 2004). It shows no sign of stopping. Final Destination 5 opens later today in the US (26th August in the UK). It has the biggest budget yet but for reasons best known to the corporation the studio has hired a debutant feature director new to the franchise. They hired the writer responsible for the worst film of 2010. Despite the return of Tony Todd the omens are ominous. The Final Destination is not the best film in the series. It is the most important one.